I had heard so many stories about how you could never get rid of the “plastic taste” in these hydration systems. This and the fact that it seemed like overkill to me to actually use one for hiking made me hesitant to buy one. However, my Deuter Futura 28L day-pack is “hydration system-ready”, so I decided to give it a try, and bought a 3l Nalgene Reservoir from Cape Union Mart. I find the drinking valve easy to use — I know that some of the systems have valves that are too “sensitive” and release water when bumped. I like the fact that I can put ice cubes in with ease. 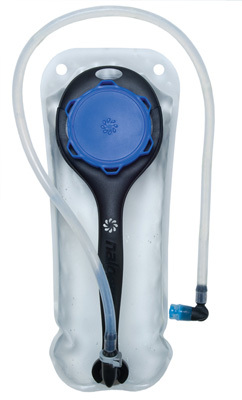 I feel that hydration bladder systems like this also make it easier to take regular sips of liquid, making it easier to keep your self adequately hydrated. Top Tip: avoid removing the bite-valve from the tube — the plastic will stretch and you will not get a watertight fit again. I use it in my Deuter Futura 32l Day-pack and Deuter Aircontact 55l Backpack, as well as my Salomon XT Wings 5 Hydration Backpack.